Wisk sugar, vinegar, mustard, celery seed, and oil together. Allow sugar to dissolve. Toss dressing with coleslaw mix. Spray parchment lined baking sheets with butter flavored food spray. Build sandwiches. Place 10 slices bread on each pan. Place 6 slices turkey pastrami and 1 oz. cheese on each slice of bread. 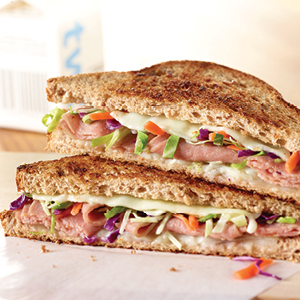 Use a #8 scoop to portion ½ c. coleslaw on top of meat and cheese. Top with second slice of bread and spray top of sandwiches with the food spray. Bake at 400°F for 5-6 minutes and then flip sandwiches. Bake for an additional 5-6 minutes until golden brown. Cut in half for service. Serve immediately or hold at 140°F. WEIGHT: 9 lbs. 6 oz. WEIGHT: 18 lbs. 12 oz. WEIGHT: 3 lbs. 2 oz. 1 serving provides 3 oz. meat/meat alternate, 2 servings bread/grain, and ¼ cup vegetable (other). Sugar, granualted 3/4 c. 1 1/2 c.
Vinegar, white or cider 3/4 c. 1 1/2 c.
Mustard, ground 1/2 tbsp. 1 tbsp. Celery seed 1 tsp. 2 tsp. Oil, vegetable 1/2 c. 1 c.
Three color coleslaw mix, RTU 4 lbs. 8 lbs. ALL NATURAL REDUCED SODIUM SLICED TURKEY PASTRAMI .5 OZ 9 lbs. 6 oz. 18 lbs. 12 oz. Cheese, mozzarella, LMPS, sliced 3 lbs. 2 oz. 6 lbs. 4 oz.